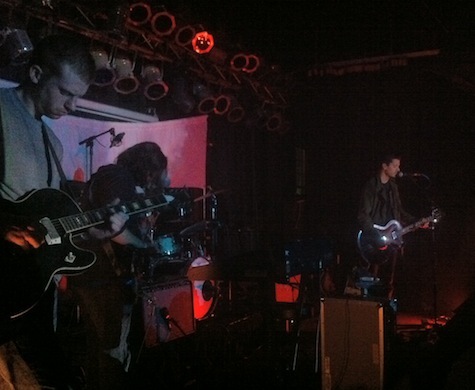 A.A. Bondy at The Waiting Room, Nov. 4, 2011. Remember last week when I said that I wanted to avoid seeing a “stand-and-play” performance? Well, what I meant was when a band comes on stage, takes their positions, and then proceeds to perform a replica of their current album, note-for-note, all the while just standing there playing the songs as if the audience wasn’t in front of them. We’ve all been to one of those shows. You realize about 10 minutes into the set that this is all you’re going to get; and that other than the extreme volume and being able to smell the people standing next to you, you might as well have stayed home and listened to the record on your hi-fi. 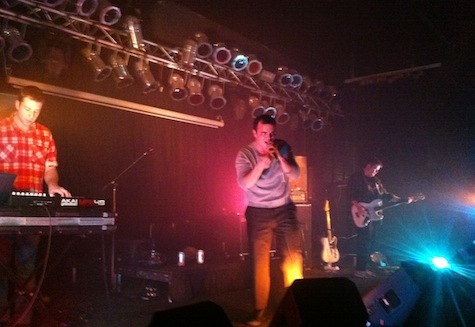 So it was last Friday night for A.A. Bondy at The Waiting Room. As I’ve said, I dig his new album — very moody, very dark, and perfect with the headphones on or driving home at night along a deserted highway. How well would it translate to the stage was anyone’s guess. Shortly after the opener finished and the necessary sound checks were done, the stage lights were turned off and a projector was fired up. Onto a draped sheet behind the band were projected serene images of the ocean — wave upon wave, soothing. That projector would be the only thing to illuminate the band with the exception of one small orange floor light. Onto the dark stage stepped Bondy and his three sidemen to the applause of the crowd. They took their places and leaned into the first sleepy track of the evening, something off the new album. It was followed by another sleepy track, and then another, as Bondy and Co. stood there in the dark and played, presumably oblivious of the audience in front of them. Well, it didn’t take long until the chatter began, which is what’s going to happen when there’s nothing for the crowd to see and no reason for them to be drawn into the performance. While the band played the songs spot-on, note perfect, who really wants that? Yes, there were a few rousing Crazyhorse-style moments later in the set, but all of it was played mid-tempo or slower while the band stood slumped in the dark, waves gently lapping behind them. But the only ocean that could be heard was the ocean of people talking throughout the club. Bondy just ignored them, just like the crowd was ignoring Bondy. I left before the end of the set thinking how much I liked listening to Bondy’s music… in my car on the drive home. Tonight at, of all places, The Omaha Community Playhouse it’s Manouche Moustache, a gypsy jazz trio performing acoustic jazz/vaudeville standup. According to the Playhouse website, “The brothers Guy, Pierre and Julian immigrated from a gypsy caravan meandering about rural France with an occasional stop in the capital to sell their wares and play for a crowd of young professionals. They made their way to Omaha to become well-paid jazz musicians and respected U.S. citizens. (They are still working to achieve both of those goals. ).” The 21+ show is free to the public (with an opportunity for donation) at the Howard Drew Theater inside the OCP. Show starts at 7:30, no reservation or tickets required. Decisions, decisions… Of the two, Real Estate was probably the hottest ticket of the night last night (from what I’ve been told, it was the bigger draw); but to be honest, their latest album (despite the raves) left me cold, and judging from their YouTube stuff, I was afraid of getting a run-of-the-mill “stand-and-play” performance. Which is exactly what I didn’t get from Future Islands. I don’t think any of the 30 or so people at The Waiting Room expected what they got from frontman Samuel T. Herring. Never mind that the trio’s music, half of which was pre-recorded samples (including the synth-drum-percussion), is like an homage to early Factory Records / New Order dance tracks — dramatic and fun. It was Herring that was the centerpiece, an absolutely mesmerizing frontman intent on connecting with the audience eye-to-eye from the stage. He looks like a young Streetcar Brando combined with Deliverance Burt Reynolds and Kirkian Shatner, but with the intensity of a Rollins or Morrissey. He owned the stage like a Shakespearean actor performing a spotlight soliloquy with a voice that ranged somewhere between Richard Burton, Pee Wee Herman (in la-la-la-la mode), a monster and Billy Idol. Like a caged gorilla pacing with knuckles dragging on the floor, Herring leaned down trying to glean any sort of eye contact from anyone who would look at him, shifting from one to one to one to one. Dramatic, and the stage lighting only added to the drama — colored floor-mounted flood lights (think Mercy Rule but with colored gels). But then between songs, Herring turned into a bro’ just chilling with his roomful of new friends, laughing and talking about the road and how much he loved being on stage (despite, he said, his recent misgivings about performing). Charming. While all this was going on, keyboardist Gerrit Welmers and bass player William Cashion were stone. They never cracked a smile or changed expression. Welmers merely stared straight-faced at his battery of synth/computer equipment, poking out melodies while Brando pounded his chest and slapped himself in the face and bounced on all fours and held his hand skyward as if singing to a Hamlet skull or to an invisible moon. You can tell this guy was once an art student — or a closet thespian. One of the best performances I’ve seen this year. Tonight at House of Loom it’s Conduits with Pony Wars. I was told that Loom doesn’t really have a “stage,” so it will be interesting to see how they set up the bands. If you haven’t been down there yet (it’s in the old Goofy Foot space) this would be great time to check it out. $5, 9:30 p.m.